As Android Wear devices and the Apple Watch nibble away at the luxury watch market, Switzerland is fighting back with unorthodox new designs, like Dominique Renaud’s new DR01 Twelve First, that manages to improve its traditional functionality while still looking completely bizarre. 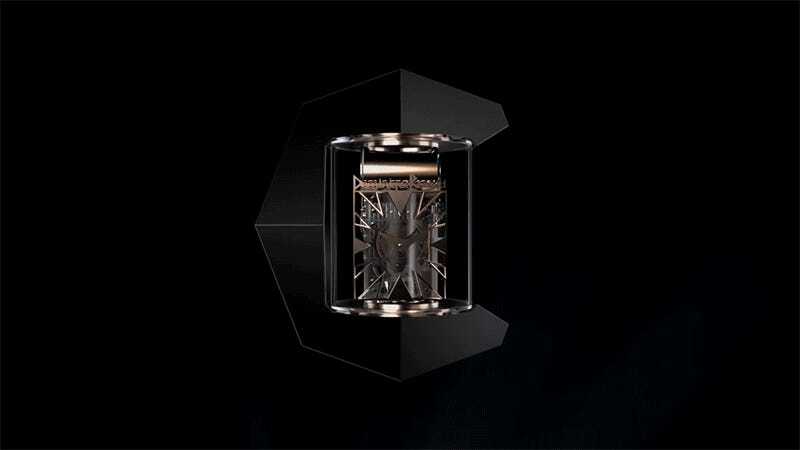 Designed by famed horologist Dominique Renaud who actually left retirement to bring the DR01 Twelve First to life, the timepiece features a new type of movement he’s called an “experimental rotary escapement” that sees the entire mechanism rotating inside a sapphire crystal cylinder. The video specifying how the movement works is a little confusing, so you’ll want to head on over to aBlogtoWatch for a more authoritative explanation on why the new movement isn’t just about looking neat. But in layman’s terms, the new movement helps reduce friction with its most critical moving parts, which in turns means the watch is far more accurate at keeping time. But if you thought even the smallest Apple Watch was outrageously priced, the DR01 Twelve First is astronomically out of your price range. Only 12 will be produced at a cost of 1,000,000 Swiss Francs each—or just north of $997,000. If you can afford to blow a million bucks on a watch, you probably don’t care if you’re a few seconds late to a meeting.